Posted on: 8th October 2012 Comments! About Shinestar Group Established in 1993, Shinestar Steel is a company group integrated with steel pipe manufacturing, domestic & foreign trade, warehousing & logistics of steel products and real estate development. Five factories capable of producing seamless and SSAW pipe are invested by the group and located in Xiangtan, Hunan Province, Changzhou & Yangzhou, Jiangsu Province, Cangzhou, Heibei Province and Ho Chi Minh City, Vietnam respectively. Being one of “China’s Top 500 Private Enterprises and Top 100 Steel Companies”, Shinestar owns 23 subsidiary companies throughout China with a total of 1800 employees. About Bestar As one of the subsidiary companies under Shinestar Steel Group, Bestar is a dedicated provider and exporter for high performance-price ratio SMLS pipes including hot-rolled, cold-drawn ones with the content of various steel grades. Main Products 1. Oil and Gas Transmission Pipe: OD: 10.3mm - 1016mm with wall thickness: 1.7mm - 52mm 2. OCTG Products: OD: 60.3mm - 508mm with wall thickness: 4.24mm - 16.13mm 3. Pipes for Pressure Use: OD: 6mm - 720mm with wall thickness: 1mm - 120mm 4. Machining Tube and Others: OD: 6mm - 1200mm with wall thickness: 1mm - 200mm Our Advantages Bestar has set up extensive international sales network covering North America, Middle East, Asia, Africa and South America etc. together with our brand partners - CPTDC, PPC, Mitsui and Weatherford. 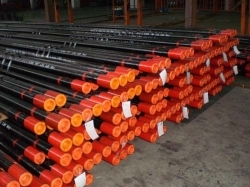 As one of the major exporters of OCTG and line pipe for crude oil and natural gas delivery in China, we topped the export amount of SMLS pipe among Hunan province in 2010. And we will keep growing and expanding the global market.